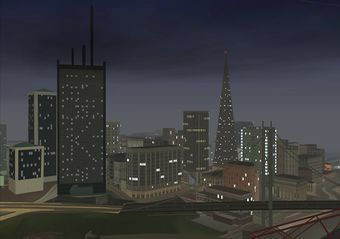 Downtown San Fierro on GTA San Andreas, as viewed over from Easter Bay. 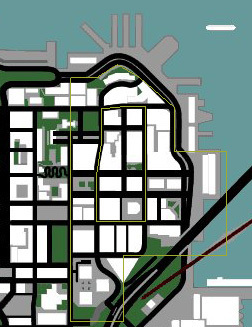 Downtown San Fierro (only referred to Downtown in the game) is the center of San Fierro, San Andreas in Grand Theft Auto: San Andreas. Enveloping the city's Financial district, Downtown is situated northwest of Easter Basin, northeast of King's, east of Calton Heights and Chinatown, and south of Esplanade East and Esplanade North. It is a bustling locale, with constant street and sidewalk traffic. Police patrol this district heavily, and the cable car line services the area frequently. Downtown is also home to several of the city's tallest buildings, the San Fierro Police Headquarters, and numerous small businesses. This locale is a focal point during several San Fierro missions, and provides two food retailers that the player may access. Following his exile from Los Santos, Carl Johnson, who along the way has befriended the pot-growing hippie, The Truth, has arrived in San Fierro to find the garage he won in a race against Claude and Catalina to be derelict. This prompts CJ and The Truth to seek out and hire The Truth's friends Jethro, Dwaine, and Zero, all living in San Fierro, to work in the Doherty garage. Along the route to locating The Truth's friends, he asks CJ to stop in certain places in order to monitor the movements of some mysterious vans. One spot is Downtown, in front of San Fierro Police Headquarters, where he advises the other passengers to "picture a pink golf ball" in their minds before urging Carl onto the next stop without explanation. With no time to lose, and with the urging of his sister Kendl, Carl sets off to turn the abandoned garage into a successful business. But this isn't possible without help from his closest ally from Los Santos, Cesar Vialpando. Together, they begin hijacking vehicles to be exported and sold from a newly acquired Downtown dealership. In an outrageous ploy for not only revenue, but attention as well, Cesar drags Carl to a dealership in northeastern Downtown, across from Esplanade East, to hijack two expensive sports cars, namely the Elegy and the Sultan (both equipped with nitrous, no less), and drive them off the second story showroom floor, leading police on a high-speed chase through San Fierro. Later, after killing Jizzy B., the Loco Syndicate's San Fierro muscle, CJ hunts down and kills T-Bone Mendez and Ryder, two other syndicate big-shots, before they can meet with Mike Toreno on Pier 69. Toreno's chopper, having spotted the dead bodies, flees to an unknown location. CJ soon learns the chopper is leaving from a location Downtown, and heads there to find the chopper taking off from the helipad of San Fierro Police Headquarters. After rushing to the helipad, CJ narrowly misses the chopper, and grabs a nearby rocket launcher and hops onto a waiting FCR-900 in order to pursue the chopper on the freeway and shoot it down. This page was last modified on 27 July 2012, at 14:38.